Gaby Zakuani is the main injury concern for manager Rob Page as the Cobblers prepare to welcome Premier League outfit West Bromwich Albion to Sixfields for their EFL Cup second round clash on Tuesday night (ko 7.45pm). The central defender has been an ever-present so far this season alongside Zander Diamond, despite the face he has been nursing an ankle problem for the past couple of weeks, and Page feels it may be time to give the former Peterborough United man a rest. Page has been delighted with the impact the 30-year-old has had on the team since signing in the summer, and he may decide to leave him out against West Brom to ensure he is ready for Saturday’s Sky Bet League One trip to Coventry City. 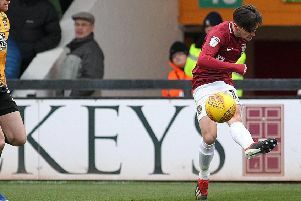 “I thought Gaby was struggling a little bit with his ankle on Saturday,” said the Cobblers. “Like Marc Richards, he is one of those that hasn’t trained that much and we have just had to throw him into the games. If Zakuani is given the night off, then Page could hand a Town debut to Lewin Nyatanga who has yet to play since signing on loan from Barnsley, with Rod McDonald also coming into contention. Page is also considering making other changes to his starting line-up, as he has pretty much stuck with the same players in the club’s opening five matches this season, with only 13 players having started matches to date, and just 16 used overall. “We will have a look at how we are going to play, and the personnel, but whoever I put out there will know their jobs and resposibilities,” said the Town manager. “They will know we have to defend like we have been doing, but the side we need to improve on is creating opportunities, and that will be even harder against a Premier League team.